Editor’s note: Peter Jonas, the author of this article, is a software developer and the OpenScore project manager for MuseScore. 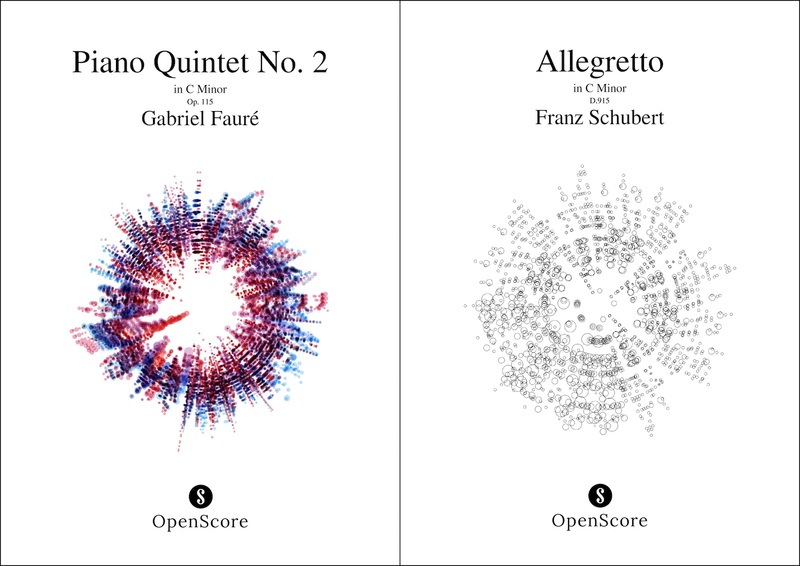 Launched just a few weeks ago, OpenScore is a new crowdsourcing initiative to digitize sheet music by the likes of Mozart and Beethoven, and make them freely available for everyone to use for any purpose. We have come a long way since we announced the project back in February, and I would like to share the developments with you now. A key challenge for most crowdsourcing projects is attracting the critical mass of contributors required for long term sustainability. OpenScore has an advantage in this regard, because it has immediate access to two of the largest sheet music communities through its parent organizations: MuseScore and IMSLP. Thanks to the generous contributions of these communities, we’ve already been able to start putting together the first OpenScore Editions. One such score is Beethoven’s Für Elise, which is also available as a Braille score for blind musicians and as Modified Stave Notation for partially sighted musicians. Making scores available in accessible formats is something that sets OpenScore apart from other open sheet music initiatives. This is made possible with the aid of our partners at RNIB and Music21. Another thing that sets us apart is our method of crowdsourcing. The lesson we took from other projects is that if you sit around and wait for people to transcribe the pieces they like, you’ll end up with ten transcriptions of the first movement of Beethoven’s 5th Symphony, and none of the other movements. We will overcome this by placing a bounty on works that have not yet been transcribed. The bounty comes in the form of free membership of MuseScore’s score sharing website. In addition to rewarding individual contributions, we will also actively create new transcriptions through a collecting crowdsourcing process where scores are split up into small pieces and sent out to many transcribers. This reduces the burden on individuals when transcribing large pieces of music, such as an opera or a symphony. This allows us to introduce new people to the software and skills necessary for transcribing. It also creates a sense of community as transcribers work together to liberate pieces. We have been running a pilot transcription project to make sure the crowdsourcing process is viable. A small number of MuseScore.com members were invited to take part in a trial transcription of Fauré’s Requiem. The trial enabled us to identify the common transcribing errors and produce a set of guidelines to help transcribers avoid them. The guidelines are mainly concerned with the proper placement of lines and symbols to get the desired effect during playback. While the engraving was not perfect, the trial proved that MuseScore’s users were more than capable of entering all of the right notes and symbols to create a semantically correct score. The layout could be improved by sending the score to a second group of transcribers who have demonstrated themselves to be particularly skilled at engraving. Even as it is, the score is already good enough for us to generate Braille for blind musicians, output MIDI and MP3, parse and analyse for research, convert to non-standard forms of notation for educational purposes, and even generate artistic visualizations. Ultimately, the point of OpenScore is not to create beautiful engravings. The value of an OpenScore edition is that it is digital, editable and parseable. The notation will be good enough to satisfy casual users (i.e. the vast majority of people) and those who are not satisfied will be able to take the OpenScore editions and use them to create beautiful engravings and critical editions, which they can do without paying royalties thanks to the Creative Commons copyright waiver. OpenScore’s goal is to liberate all public domain music, and we still have a long way to go developing the systems and tools to make this possible. It is for this reason that we have launched a Kickstarter campaign. By promising an initial set of 100 scores, including history’s most influential pieces, we hope to raise enough money to develop our platform further. Backers can help pick the pieces to be liberated, so do check out the campaign if there is specific work or composer you want to see liberated. I look forward to sharing to our progress with you at a later date. Is it necessary to use MuseScore to be a contributor to the OpenScore project? I’d like to create scores and submit them to OpenScore, but I’m fluent in Sibelius and I’ve never used MuseScore. I would prefer to create scores in Sibelius and submit them to OpenScore in Sibelius and MusicXML document format. Will OpenScore accept work in those formats for inclusion in your project? I’ve got the skills and the time and inclination to want to help, but I have many years invested in Sibelius skills and I don’t actually want to learn to use MuseScore. I think there are a lot of other musicians out there who are in my situation, working in Sibelius or Finale. What is your policy on this? also the passions, magnificat, christmas-oratorio, some of the messes…. This is a reply to Wheat Williams and Heinz-Gerd Paßen. If you do decide to do the conversion yourself (which isn’t all that difficult to do, I will post an article detailing how later) this has the advantage that you will get more control over what the finished score will look like. You will also be all setup to make future improvements to the score. However, if you would prefer to submit MusicXML then I’m sure there will be no shortage of contributors willing to help maintain the score once it’s uploaded (naturally you will be credited as the initial transcriber). See this article about how to submit transcriptions https://musescore.org/en/node/225471. If submitting MusicXML you don’t need to upload it to MuseScore.com. Simply email it as an attachment along with the other information requested. I’m a Sibelius user too. I know nothing about MuseScore so I have no idea whether it’s worth trying or not/costs etc. I used to teach at the College for Blinda and Partially Sighted in Worcester, so I know James Risdon and would like to help. But!!! This is a reply to Sheila Joynes. MuseScore is free, so there are absolutely no costs whatsoever! You can download it from https://musescore.org/, and there are links there to tutorials, a handbook, and forums where you can ask for help if you need it. As you know, we are working with James Risdon and colleagues at RNIB to make OpenScore editions available in Braille and Modified Stave Notation for blind and partially sighted musicians. I will also be working with James on a separate project to improve extend MuseScore’s accessibility features. I’m very interested in the idea of having the wealth of IMSLP’s music available as free notation files. I’m more than happy to contribute labor towards this, but I don’t see what costs $500 about this process of volunteers doing transcribing. I think it would be better to have more works transcribed than to be commissioning an artist to make covers for each of them. I’d consider hopping in on the Kickstarter if they were interested in hosting .sib and .musx files in addition to musicXML and MuseScore’s format, but I just don’t see how the money’s being put to use. I know IMSLP’s servers aren’t free to run, but I can’t see that $50,000 is the necessary amount for a volunteer project. I submitted an offer to transcribe months ago to help and haven’t heard back. This is a reply to Ehler. Thanks for your comment. Running a crowdsoucing effort is not cheap, as there needs to be a dedicated team in place to ensure everything runs smoothly and efficiently. Think of Wikipedia for example, which has to raise money to maintain its platform even though the content is created by volunteers. This funding allows us put the infrastructure in place to grow the OpenScore catalog from 100 works to 1000 and beyond. When an OpenScore edition is published the work is not done. OpenScore transcriptions are living files which will be continuously updated and improved. Because of this, we can only offer the files in formats that we can convert to automatically. Unfortunately, conversion from MusicXML to other formats is not guaranteed to preserve formatting information, so there is no advantage to us offering files in other formats compared to just offering the MusicXML and leaving individuals to do the conversion. However, we do hope that the availability of the OpenScore editions will drive the development of better MusicXML converters, making the task easier in the future. You can sign-up to transcribe at https://musescore.org/openscore-transcribe, or tell us about transcriptions you have already done by following the instructions at https://musescore.org/en/node/225471. We will be reaching out to transcribers shortly after the Kickstarter campaign has finished.